DB Sports Tours, in association with Coerver Coaching Munster, are bringing you to Manchester to train at Manchester United’s famous Carrington Training Ground. The trip, which will be between 30 October 2016 – 1 November, will provide these Munster kids with the opportunity to travel to the Aon Sports Complex, and be coached by Manchester United’s elite coaching staff. This is an exclusive opportunity DB Sports Tours and Coerver Coaching Munster are delighted to invite your club too in the near future. You will get to train at the Carrington Training Ground, where you will play on the same fields as the famous Class of 92, such as David Beckham, Paul Scholes, and Ryan Giggs. Along with your hard work, you will have time for much more fun too; like Coerver taking in the Premier League giants Manchester City at the redeveloped Etihad Stadium. Your schedule for the trip is spread out to make the most of your time, so you can gain as much valuable experience as possible. Day one of the trip will see you cross the Irish channel from Dublin Port to Holyhead, where you will travel straight to Manchester. Upon arriving in Manchester you will get to visit and take a tour of the world famous Old Trafford Stadium. Following the tour it’s down to business: to the Aon Sports Complex. 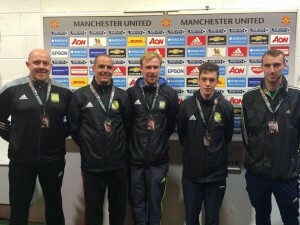 Through training with elite level coaches at Manchester United’s Aon Sports Complex (formerly known just as Carrington), you will gain valuable insight in understanding football from a professional perspective. You will stay in one of our 3 hotels on offer, where dinner will be provided, before rest for the next day ahead. Day two the fun will continue with an early trip to take on one of Manchester’s local clubs or for the more elite teams a tie against an academy side. Next up you will travel to the Etihad Stadium to take in some live Premier League action, with Manchester City ready to strut their stuff with the usual slick style. Following such a long day you will then travel back to the hotel for dinner and free time. For more information you can contact the company directly on the phone via +353 (1) 5252 921, by email to info@dbsportstours.ie, or have a look at our new website which can be found at www.dbsportstours.ie. You can also look at our blog for past testimonials and information on our tours here.